New Liturgical Movement: Why Did Vatican II Open on October 11? The question arises, therefore, as to what it was about the date October 11 that called Ephesus to mind, and why the Pope felt the need to do so in the context of the upcoming council. Pope John had a strong devotion to Bl. Pope Pius IX, whom he once expressed a desire to canonize by acclamation. (It is appropriate that they were beatified together in 2000.) It was, of course, Pius IX who convoked Vatican I, which held its first session on the feast of the Immaculate Conception in 1869, fifteen years to the day after he had formally and infallibly defined the Immaculate Conception as a dogma of the Faith. In 1931, Pope Pius XI extended the feast known as “the Maternity of the Virgin Mary” to the universal calendar of the Roman Rite. October had been well established as a Marian month by the very popular feast of the Holy Rosary, and the importance of this devotion was repeatedly emphasized by Pope Leo XIII. The feast of the Virgin’s Maternity was therefore assigned to October 11th, which was then the first free day of that month. A Breviary lesson was appointed for the feast, which explains that the Pope intended it to serve as a liturgical commemoration of the fifteenth centenary of the Council of Ephesus. In the wake of Ephesus, Pope Sixtus III (432-40) built the Basilica of Saint Mary Major in Rome, the oldest church in the world dedicated to the Mother of God, which still preserves a famous mosaic with episodes of Her life on the arch over the altar. 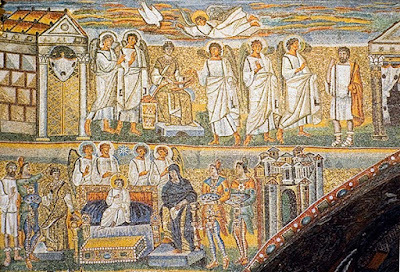 Pius XI also notes in this lesson that had arranged for extensive restorations of the basilica, “a noble monument of the proclamation of Ephesus,” and particularly the mosaic. The upper left section of the mosaic on the triumphal arch of Saint Mary Major, with the Annunciation above and the Adoration of the Magi below; to the right of the Annunciation, the angel comes to reassure St Joseph. In the Adoration of the Magi, Christ is shown as a young child, but not as an infant, since the Gospel of St Matthew does not say how long after the Birth of Christ the Magi came to Him. 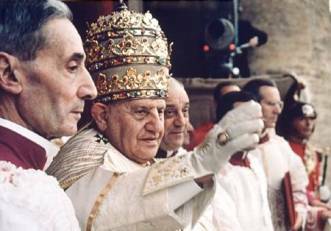 John XXIII’s choice of October 11th, therefore, was intended as a sign of continuity not only between his council and Vatican I, but by inference, with all of the previous ecumenical councils. As Bl. Pius had placed his council under the protection of the Mother of God by opening it on one of Her feast days, so did St John, the feast in question being also a commemoration of yet another Ecumenical Council, and one especially associated with the Church’s devotion to the Virgin Mary. In the post-Conciliar liturgical reform, the feast of the Maternity of the Virgin Mary was suppressed, on the grounds that the newly-created Solemnity of Mary, Mother of God, on January 1st made it superfluous; another fine example of the law of unintended consequences, and of the many efforts to obscure and erase Pope John’s intentions for what he wished the Council to achieve. Note: The Council of Constance, which was held from 1414-18, represents the high point of enthusiasm for “conciliarism”, the idea that ecumenical councils are superior to the Popes, and have authority over them. As part of this enthusiasm, it decreed that councils would henceforth be held on a regular schedule, five years after its own closure, seven years after the closure of the next council, and thenceforth every ten years. The Council of Siena, called in 1423, is not recognized as an ecumenical council because almost no one showed up for it. The next council opened at Basel in Switzerland in 1431, to an equally unpromising start, and, like Siena, would have ended as no more than an historical footnote, had its purpose not changed; after being transferred first to Ferrara, then to Florence, it became the last great council of reunion between the Eastern and Western churches. Between the closure of Constance and the opening of Basel is an interval of only 13 years, but this interval was determined by Constance itself, and not as the result of an intervening crisis, as was the case with Chalcedon after Ephesus. The sudden and complete evaporation of enthusiasm for conciliarism in the 15th century is very similar to the sudden and complete evaporation of enthusiasm for “aggiornamento” in the 20th. There is an important lesson to be had here in keeping our perspective on ecumenical councils, the most unpredictable of ecclesiastical events, if we are willing to learn it.